One of the most frustrating things about Instagram is that it doesn’t give users a lot of options for sharing links. If you use Instagram for your business and want to link to important content like your email list sign up, blog posts or other social media accounts, you’re options are limited to one link in your profile. Many people work around this problem by using a service like linktree or linkinbio, but it only takes a few minutes to create your own Instagram landing page on your website, which allows you to more closely track clicks, and gives you all that good traffic! When you create an Instagram profile landing page on Squarespace or whatever site hosts your website, it doesn’t need to be anything fancy. In fact, I kept mine extremely simple and mimicked the look of the link in bio services many people use. Take a look at the video below to see the simple step-by-step process to create your own instagram profile landing page if you have a Squarespace blog. While you’re at it—how about an Instagram bio makeover? Make sure your Instagram bio has these 5 important things. Don’t miss out on all the FREE learning and resources. Click below to join our group. It’s the beginning of a new month, so that means it’s time to take a quick look at your social media account health and insights. By take a few minutes to check on things like your top posts, followers, and most engaging content, you can make plans for the month ahead that will continue to connect with your audience and move your business forward. But what kinds of insights should be looking at each month to decide if your marketing efforts are working? When I’m looking for my top posts each month, there are lots of factors to consider. Many of these factors will depend on your business goals—do you want to drive traffic to your online shop? Are you trying to build your email list? Are you looking for clicks to your “call now” button? Are you growing a group? Or are you trying to reach more local customers? These are the goals you need to consider as you dig into your insights and decide how you’ll analyze your top performing posts each month. And as your goals for your business change, so will what you measure. Are you focusing on your email list in March, and a launch of a new product in April? Then how you analyze your insights those months will reflect those goals. Another important part of your monthly check-in should also be setting goals to move forward. I like to set goals for follower counts, look at upcoming holidays, themes or launches, and set goals on how often I can consistently post on each social media platform. I give each of my pages a quick health check by refreshing cover images, profile pictures (if needed) and making sure all links are up to date. And on Instagram, I make sure I’m doing a quick round of hashtag refreshing, so I have new groups of hashtags ready for use in my posts. Get my ULTIMATE Guide to Hashtags HERE. It’s everything you need to know to make hashtags work for you! While it may seem like a lot of things you need to check, this process will become easier the more you do it consistently. It will become easier to find the insights you need and to know what goals you need to focus on first. To help use your insights to set goals and create a social media plan you can stick to, download my guide for Instagram and Facebook. It will walk you through the important health checks you need to make for your account, what insights you should be watching, and what goals you want to focus on for the months ahead. And it’s purposely undated so you can use it month after month. Click the link below to download my entire social media insights planning guide! You're probably hearing it everywhere. Social media is all about video these days. Video is how you get more engagement. You HAVE to be doing video on Facebook and Instagram. For a long time, I plugged my ears and didn't listen to what "they" were saying about video. I was convinced that I could just keep on doing what I was doing and ignore the fact that everything seemed to be pointing in that direction. I was a behind the scenes kind of person. It was probably what drew me to photography--I definitely preferred to stay behind the camera not in front of it. I hated the way my voice sounded, my face looked on camera, the list in my head went on and on. But over the last several months this girl who loathed the thought of being in front of the camera, let alone recording a LIVE video has had a complete conversion. I'd even be bold enough to say that I ENJOY doing videos. And I'd be even bolder to say that I PREFER live videos! What?! Just like you've always been told, things get better and easier with practice. And that is absolutely true with video. I don't have any fancy equipment or lighting. Just my iphone, a tripod and some ear buds. But before I even got brave enough to hit that record button, I did a few things to get myself ready. Here are 5 things that helped this introvert get in front of the camera and start making videos. 1. Download the Marco Polo app on your phone and use it! My friends introduced me to this app and at first I was like "No. Way." Basically, MarcoPolo is like text messaging but with video. Instead of the annoyance of typing out a text message to my friends, I can pop on and leave a little video. Though it sounded like something that would require a shower, hair and makeup, it quickly became real life--dirty hair don't care--interactions with my friends. And I'm convinced this was the first step in me becoming more comfortable in front of the camera. I got used to seeing my own face, hearing my own voice and even learned a little bit about how to hold the camera so it was more flattering to this girls' double chin. And I was on there with my close friends, sister, even my mom! Our messages back and forth helped me shake off my fear and get some solid practice in front of the camera in a completely non-intimidating setting. 2. Warm up your audience. If the thought of suddenly having your face in your feed after weeks or years of pictures of your vegetables and knitting projects gives you all kinds of hives, then start slowly. Do a #FridayIntroduction on your Instagram, get your kids or a friend to snap a candid picture of you that you can share. Hop on Instagram stories and start talking while you're holding the camera, even if you aren't on screen. Get people used to hearing from you, if you feel like jumping in to videos cold turkey would just be too abrupt. Make sure you do your homework before you go in front of the camera. Know what you want to say and the order you're going to say it in. AND, don't neglect your welcome and your closing! I've had to hit delete and start again MANY times because I only planned out the meat of my video and didn't think about how I was going to introduce myself to my audience or what I was going to say as I closed down the video. Make sure you give this some thought and some practice before you go live. What do I do with my hands? Put something in them! Hold on to your list or video notes. Or even better, use a clipboard with a paper and the 3-4 points you’re going to be discussing. And hold it up to your camera so folks can follow along. Make sure your props aren't distracting or noisy (I'm looking at you clicking ballpoint pen) and use them to help you feel more relaxed during your videos. Does the thought of going live give you hives and sweaty palms? I hear you, but I'm telling you, I've discovered that live videos are much more forgiving and easier then pre-recorded videos. While they can't just be sloppy and disorganized, there is a more casual, relaxed atmosphere to live videos. They are more forgiving and as a viewer, I easily overlook mistakes--did you flub your words, lose your place or have your kids interrupt? When you're live, it's like you're talking to a room full of friends, not trying to create a polished final product. For me, as a former teacher, it's like standing up in front of my classroom teaching. It feels more relaxed and comfortable. 6. Don't make it about you. Did you notice all my excuses for not wanting to be in front of the camera? Every single one of them had something to do with me or my insecurities. When I had the realization that I was making these videos all about me, instead of all about my audience and the people I want to serve, there was a major shift in my thinking. These videos weren't to show people how put together I was, they were about teaching my audience something valuable that would help them grow their businesses and succeed. Once I made that mental shift, suddenly all those self-centered excuses didn't seem to matter. I'm going to take a wild guess that chances are you're really over-thinking this. Just jump in there and do it. Challenge yourself to do a video a week for one month. Or a video a day for one week! Practice and plan, yes. But then stop over-thinking and just go for it. You'll be so glad you did. Am I now creating perfectly polished videos with great lighting and amazing sound quality? No. But I am getting better and I am finding video a valuable way to connect with my audience and share new ideas and learning with them. It's been the best scary jump I've made in my business this year. Want to check out some of my videos? 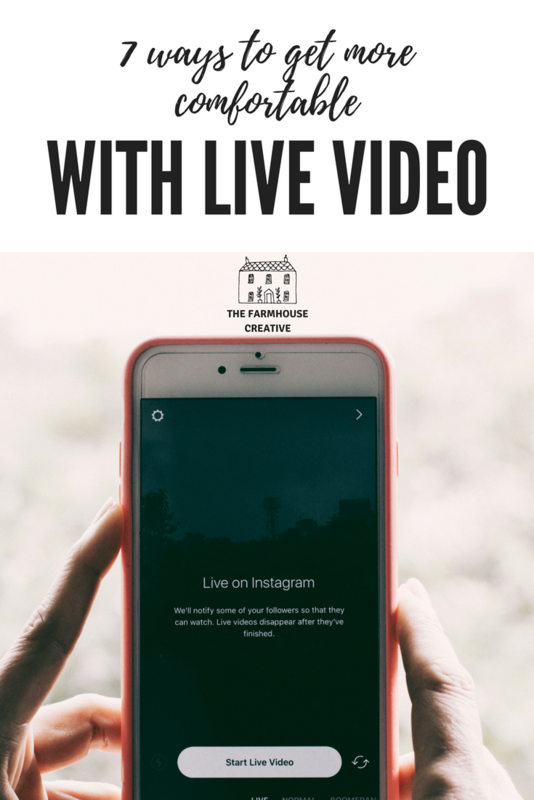 Join our private Facebook group--Farmhouse Creative Marketing Community and don't miss out on the tips, tricks and goodies I'm sharing over there! It happens to all of us! We've got no idea what we should post on Instagram today but we know we need to. Use this list of 30 post ideas to keep you posting consistently throughout the month!